Evergreen spring-flowering shrub, endemic to Southern Africa where it grows as an understory plant in forests and along stream-banks. Glossy dark green leaves, 7-13 cm long, arranged in opposite pairs, with wavy and sparsely toothed margins. Pale lilac, tubular flowers, 3-5 cm long, marked with delicate, darker coloured lines, arranged in racemes. Thrives in deep shade and any well-drained soil. Low drought tolerance. Flowering tends to be encouraged by a few hours of sunlight, but foliage may turn yellow when planted in full sun. Responds well to feeding. Water regularly during hot dry summers. Prune after flowering to maintain a compact shape. Tolerates light frosts (zones 9-11). Attractive plant with lush foliage and lovely spring flowers. Perfect choice for shady areas, in particular as a filler or a backdrop for other shade-lovers. Bushy shrub or small tree with rounded to heart-shaped, 5-10 cm wide, aromatic leaves with prominent veins. Dark green foliage in shade, lighter green in more open positions. Leaves often covered with holes caused by the kawakawa looper moth caterpillar. Zigzagging branches, swollen at the nodes. Minute, inconspicuous female and male flowers on separate, 4-8 cm long spikes, usually on separate plants. Female flowers are followed by tiny tightly packed berries, green at first, turning orange later, providing food for birds. Occurs naturally in forests and other shady areas throughout the North Island and northern parts of the South Island of New Zealand. Leaves, bark, fruit and roots have medicinal properties. Tolerates light frost. Prefers moist, well draining soil, but in warm humid areas, a more exposed position and relatively dry soil is best to prevent fungal diseases. Can be pruned to shape. Excellent filler for shady areas. Also suitable as a container plant. Deciduous tree with an upright habit when young and a rounded canopy when mature, 5-7 m tall, flowering from about 3 years of age with large, scented flowers in late winter and early spring. Developed in New Zealand by Felix Jury during the 1960s from a cross between Magnolia x soulangeana 'Lennei 'Alba' and Magnolia 'Mark Jury'. Flowers have a cup-and-saucer shape, with the outer petals opening out to form the saucer and the inner petals remaining more or less closed in a loose cup. Flowers are white, flushed with dark rosy pink-red at the base. Large green, ovate to obovate leaves. Prefers a position in full sun or partial shade, in well-draining neutral to acidic soil. Likes a cool root-run, which over time will be provided by the shade from its own canopy. After planting, cover the ground with mulch to keep the root-zone cool. For areas with poorly drained soils, consider planting Magnolia 'Athene' in a raised bed or on a slope. Protect from strong winds. No pruning required other than shaping and removing dead branches. Frost hardy. Excellent specimen tree, producing masses of large flowers from a young age. Small, upright, deciduous tree, flowering in early spring with goblet shaped, pale golden yellow flowers, 10-15 cm wide. Begins to flower on bare wood, just prior to the emergence of the new foliage. Dark green leaves to 15 cm long. Bred in New Zealand (a Jury hybrid). The first yellow Magnolia with goblet-shaped flowers. Prefers a sunny position in any free-draining, neutral or slightly acid soil. Requires shelter from strong winds. No pruning required, except for maintaining a good shape if necessary. Generally no pest and disease problems. Frost-hardy (at least down to -15 deg Celsius). Magnolia 'Honey Tulip' is a stunning little tree, flowering from an early age. The flowers actually appeared more yellow in reality than they do in the photographs. This is like a yellow version of Magnolia 'Black Tulip'. Deciduous tree with rounded canopy, flowering on bare branches from a young age during late winter and early spring. Hybrid developed in New Zealand by Felix Jury from a cross between Magnolia x soulangeana 'Lennei' and Magnolia 'Mark Jury'. Furry grey flower buds open to large bowl-shaped flowers, about 20 cm across, white inside, and flushed with pink on the outside. Conspicuous reddish stamens in the center. Ovate to obovate, fresh green leaves. Prefers a sheltered position in full sun or partial shade in slightly acidic, well-drained soil. Deciduous magnolias generally don't like being transplanted, so select a spot where it can stay. Cover the soil with mulch after planting to keep the roots cool. Avoid disturbing the shallow root system too much, and underplanting is not recommended until after the plant is well established. No pruning required other than removal of dead or damaged branches, and occasional shaping. Frost hardy. Magnificent specimen tree for flower display. Upright, deciduous tree with masses of goblet-shaped flowers on bare branches in spring. Hybrid, originating from a cross between Magnolia x soulangeana 'Lennei Alba' and Magnolia veitchii, bred by Tod Gresham. Somewhat similar to Magnolia denudata, but smaller-growing with a later, longer flowering season. Flowers are white, flushed with dark pink at the base of the outer petals (tepals). Obovate, light to mid green leaves, to 20 cm long and 10 cm wide. Prefers a sheltered position in full sun or partial shade and well-drained, slightly acidic soil. Cover the soil with mulch after planting to keep the root zone cool. No pruning required other than removing dead or damaged branches. Magnificent specimen tree, suitable for the smaller garden. Deciduous, upright columnar tree with large vibrant wine-red flowers during late winter and early spring. Flowers open from large, furry grey flower-buds to loose goblets of 10-15 cm across and finally to star shapes up to 25 cm wide with the innermost petals remaining closed. Hybrid developed in New Zealand, possibly originating from a cross between Magnolia 'Spectrum' and Magnolia 'Vulcan'. Prefers a sheltered, sunny or partially shaded position in well-draining, slightly acidic soil. Like many other shallow-rooted plants, deciduous magnolias like a cool root run and growth tends to be better once the surrounding plants or the trees themselves cast a shadow over the rooting zones. Mulch at the time of planting will also help with this. For soils with poor drainage, consider planting Magnolia 'Strawberry Fields' in a raised bed or on a slope. Magnificent specimen tree for flower display over a long period from late winter. Deciduous, spring-flowering magnolia, starting as a shrub and eventually growing into a multi-stemmed tree (unless trained from an early age). Soft yellow, lightly fragrant flowers emerge before the new leaves from large flower buds covered with yellowish moss-like fur. Initially the flowers are tulip-shaped. Gradually the petals open to a saucer-shape up to 20 cm wide. The yellow colour comes from Magnolia acuminata, which has been crossed with Magnolia denudata to produce a number of hybrids, Magnolia 'Sundance' being one of them. Large mid green, oval leaves. Prefers a sunny or partially shaded position in well-draining neutral or acidic soil. Protect from strong winds. Likes a cool root-run, which eventually will be provided by the shadow of its own canopy. At planting time, cover the soil with mulch to keep the roots cool. Frost hardy to about -15oC, but in frost-prone areas avoid a position in morning sun to minimise the risk of frost damage to the flowers. No pruning required other than removal of dead branches and creating a good shape. Elegant specimen tree with stunning flowers and unusually coloured flower buds. Deciduous tree with beautiful white flowers during late winter and early spring. 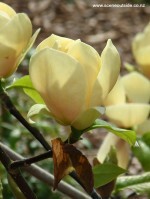 Hybrid of uncertain parentage, possibly originating from a cross between Magnolia campbelii and Magnolia sprengeri var. elongata. Flowers are about 15 cm across, white, flushed with pink at their base. Plant in a sheltered, sunny or partially shaded position in well-draining, slightly acidic soil. Like many other shallow-rooting plants, deciduous magnolias like a cool root run, and better growth can be expected once the surrounding plants or the trees themselves cast shade on their roots. For poorly draining soils, consider planting Magnolia 'Thomas Messel' in a raised bed or on a slope. Covering the ground with mulch after planting also helps to keep the roots cool. Beautiful specimen tree for flower display from late winter. Deciduous Magnolia with huge, burgundy red flowers from an early age during late winter or the beginning of spring. The colour is generally most intense early in the season and on mature trees. The lightly perfumed flowers are about 20-30 cm across. Erect, slender tree, broadening with age. Bred by Felix Jury (New Zealand) from a cross between M. campbelii 'Lanarth' and Magnolia liliiflora 'Nigra'. Prefers a sheltered, sunny position in well-draining neutral or slightly acidic soil. Likes a cool root run, which will eventually be provided by its own canopy. At planting time, cover the ground with mulch to keep the roots cool and to retain moisture during summer. Particularly suitable for climates with warm summers. The colour tends to be less intense in countries with cold summers (regardless of the winter temperatures). USDA zones 6-9. Spectacular sight when in full bloom. Use as a specimen tree. Deciduous tree up to 10 m tall, native to central and eastern China. Low-branching habit with spreading branches. Oval to oblong mid-green leaves with downy undersides, 15 x 8 cm. Flowers within three years. Mature specimens produce masses of scented, lily-shaped white flowers on bare wood in late winter and early spring before the new leaves appear. The outside of the flowers may be flushed with pink or rosy red at the base, but most specimens have pure white flowers. The Chinese have cultivated this magnolia for many centuries, going back as far as the Tang Dynasty (618 AD). It is depicted as a symbol of purity and candour in ancient paintings, embroideries, on scrolls and porcelains. Magnolia denudata was the first magnolia to be introduced from Asia to the Western world (England-1780). Prefers a sheltered position in full sun or partial shade in any well-draining neutral or acidic soil. Intolerant of overly wet or dry conditions. Frost tolerant but flower buds may be damaged by late frosts. Magnificent specimen tree, producing exquisite flowers from an early age. Deciduous shrub or small tree with rounded canopy, and smothered with flowers during late winter and early spring. Native to Japan. Slightly fragrant, pure white, star-shaped, 8-12 cm wide flowers with at least 12 narrow petals emerge from large, grey, hairy flowerbuds before new leaves. Flowers are occasionally flushed with pink. There are a couple of pink-flowering cultivars in existence. Young leaves are bronze green when they first appear, turning mid to dark green on maturity, and changing to yellow just before they fall in autumn. Leaves are oval to oblong, about 10 cm long and 4 cm wide. Prefers a sheltered position in full sun or part shade in moist, but well-drained, slightly acidic soil. Tolerates lime. Frost hardy, but flowers may be damaged by late frosts. No or minimal pruning during late summer is all that is required. Lovely magnolia suitable for flower display in the smaller garden. Hardy, deciduous shrub or tree, growing to about 6-8 m, with fragrant flowers on bare branches. Magnolia x loebneri 'Leonard Messel' originated from a cross between Magnolia kobus and Magnolia stellata 'Rosea' in Leonard Messel's garden at Nymans estate in Sussex. Oblong to elliptic, mid-green leaves, to about 12 cm long and 5 cm wide, turning yellow and brown in autumn. Rose-pink buds open in late winter or spring to scented flowers with up to 12 narrow petals, similar to those of the star magnolia (Magnolia stellata), pink mainly on the outside and white inside, 10 cm wide. Flower colour tends to be paler when spring temperatures are low, and darker pink in warm spring weather. Prefers a position with a cool root run, in full sun, well-drained, slightly acidic soil, and sheltered from strong winds. Flowers are more frost-hardy than those of most other magnolias. Minimal pruning required. Just remove damaged, dead or crossing branches in mid summer. Avoid root disturbance. An elegant specimen tree, flowering profusely for about 4-5 weeks. Looks great as a feature plant with night-lighting. Plant close to an area where you can enjoy the subtle fragrance. Small deciduous tree with a beautiful display of bright crimson red fruit, flushed with yellow-orange, during autumn and well into winter. New Zealand bred crab apple cultivar, developed from a cross between Malus 'Gorgeous' and Malus 'John Downie'. The plum-sized fruit are produced in clusters, usually untouched by birds until very late in the season, and are ideal for preserves and jellies. Green leaves with lighter undersides, turning yellow and orange in autumn. Pink flower buds open to reveal 3-4 cm wide, white flowers in spring. Prefers a sunny position in any fertile, well-draining soil, protected from strong winds. Frost hardy. Tolerates quite dry conditions once established. Avoid constantly wet or waterlogged soils.Prune when young to create an attractive framework, and thereafter prune occasionally to maintain a good shape, and remove dead or damaged branches. Magnificent specimen tree, flowering and fruiting profusely. Great smaller growing alternative for cherry blossom trees. Suitable for large containers. South American, twining vine with clusters of very fragrant, funnel-shaped, pure white flowers in summer. The flowers are 4 to 6 cm wide with a 3-5 cm long tube, and are followed by long, bean-like fruit pods. All parts of the plant contain a poisonous, milky sap that may cause skin and eye irritations when touched. Evergreen in warm climates, but behaves as a deciduous plant in colder climates. Grows best in a position that doesn't get too hot in summer, with well draining soil where it receives morning sun and afternoon shade. Not suitable for heavy clay. The roots don't like being disturbed, so avoid digging nearby. Can be cut back hard. Tolerates light to moderate frost (zones 9-11). Intensely fragrant flowers, especially in the evenings. May climb into adjacent trees by winding its stems around the branches, but is quite easy to keep under control. Lovely climber for archways, pergolas and fences.